Leaving home for the first time to head off to college is a big step in a young person's life - especially so since it often means saying goodbye for a while to a furry family member who's been there through thick and thin. Fortunately for 19-year-old Jake Ostrowski, an arriving freshmen at Texas Tech University, his dog Jesse will never be far away in spirit. Sensing that her son could use a reminder of the loving pup he had to leave behind, Jake's very cool mom, Sharla, had an awesome idea to make his new home a little cozier and familiar. 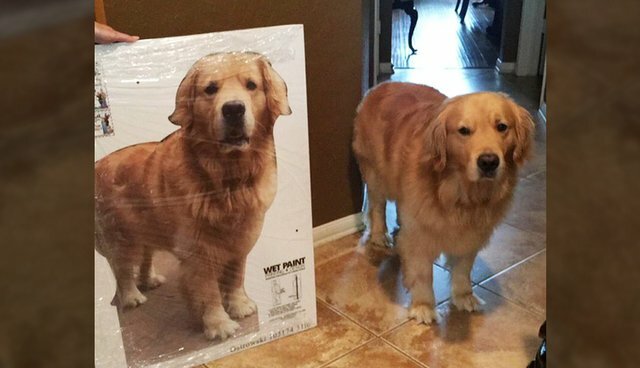 She made him a Jesse-shaped cardboard cutout to fill-in for the beloved pup while Jake was away. ... Where Jesse's life-sized cutout was given some prime real estate on the dorm room wall. Now that's starting college off right. Even with his beloved dog around in spirit, we hope Jake makes it home to visit Jesse and his family often throughout the school year - and we're sure he will. After all, there's simply no replacement for the real thing.